In our last post we discussed how the Olympic averaging process will almost certainly result in lower price guarantees for corn and soybeans in 2016. In this post we take a look at the county level yield and revenue guarantees. What about Yields and Revenues? We have pointed out that yields play a critical role in determining ARC-CO payments. 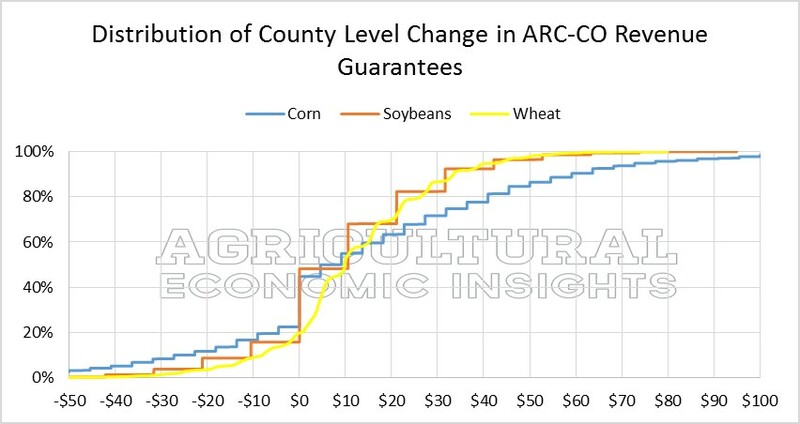 Because the ARC-CO benchmark prices for corn and soybeans are the same in 2014 and 2015, whether a county’s revenue guarantee will increase or decrease depends on 2014 county yields. The Olympic average yield for each county is calculated in the same manner as the prices, throw out the high and low from the last five years and average the remaining three values. Since the FSA released the yields that they used to calculate the 2014 ARC-CO payments we can now calculate the yield and revenue guarantee for each county and crop. We calculated these values for every county for corn, soybeans, and wheat. Some descriptive statistics for these calculations are shown in Table 1. The calculations show that the revenue guarantee will increase for over half of all counties. In the case of wheat, 80% of all counties can expect their revenue guarantee to increase. This is due in large part to the increase in the benchmark price for wheat. As you can see, on average, the guarantee increases are a relatively modest ranging from $9 (soybeans) to $14 (corn). However, it is worthwhile to note that there are some counties that will experience rather large changes in their revenue guarantees. Table 1. 2014 to 2015 Change in per Acre County Revenue Guarantees for Corn, Soybeans, and Wheat. Figure 1 shows the distribution of changes in county level corn, soybean, and wheat revenue guarantees. In the case of corn, about 20% of counties will see an increase greater than $41 per acre. Whereas for soybeans and wheat, very few will see this large of an increase. Figure 1. 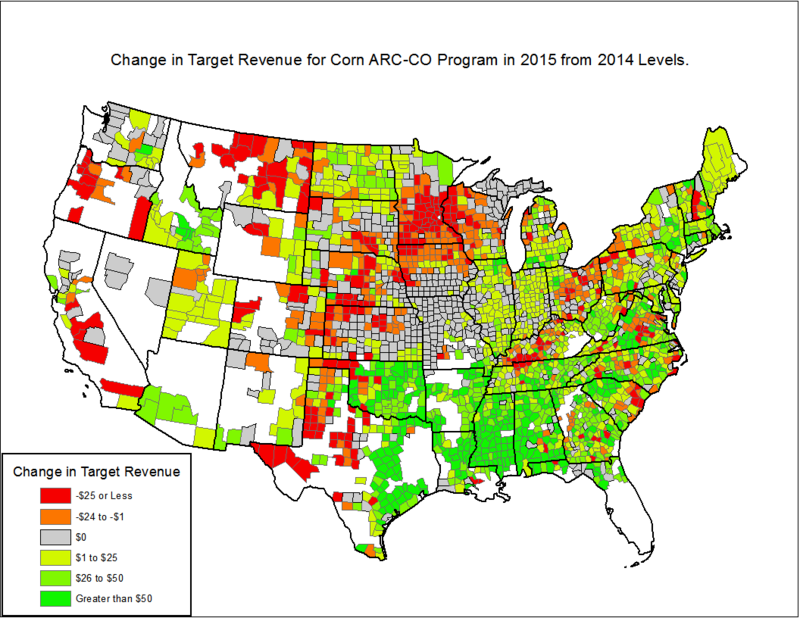 Distribution of Changes in ARC-CO County Revenue Guarantees for Corn, Soybeans, and Wheat. We have also prepared maps that show changes in the county level guarantees for each crop. The maps below are for counties with dry land or combined dry land and irrigated practices. To see the maps for counties with separate irrigation practice you can click on these links (corn, soybeans, wheat). The first figure shown below is for corn. The maps show all of the counties with zero change in a neutral gray color. These counties tend to be located along the southern half of Iowa, Missouri, and Kansas. Areas in the Southern U.S., Illinois, Indiana, and North Dakota will generally see their guarantees increase for corn. On the other hand, Iowa, Minnesota and many areas of Nebraska and Kansas appear to be experiencing stagnant to declining revenue guarantees on corn. Figure 2. 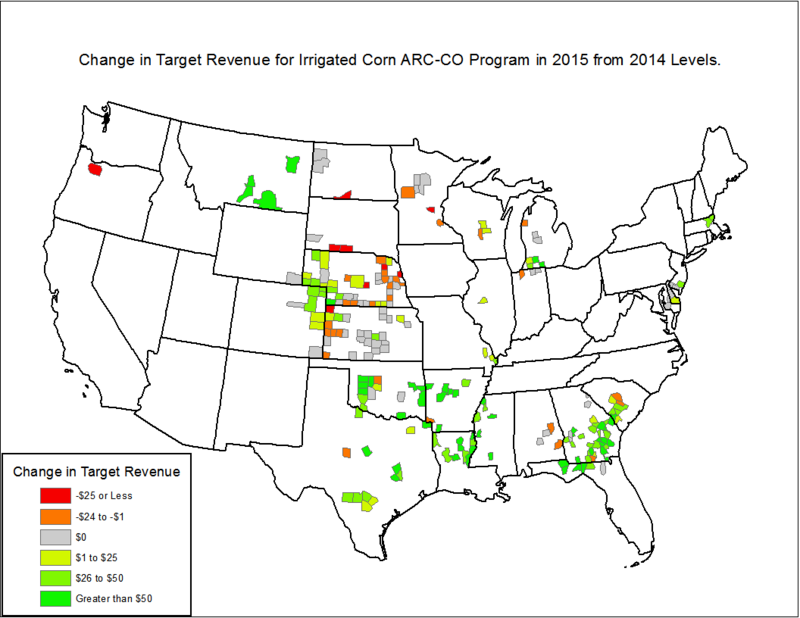 Map of Changes in ARC-CO Corn Revenue Guarantees. In the case of soybeans, similar areas will see increases although one doesn’t see the large increases in the South as were observed with corn. Further, the counties with zero changes tend to be more widely dispersed than was the case with corn. 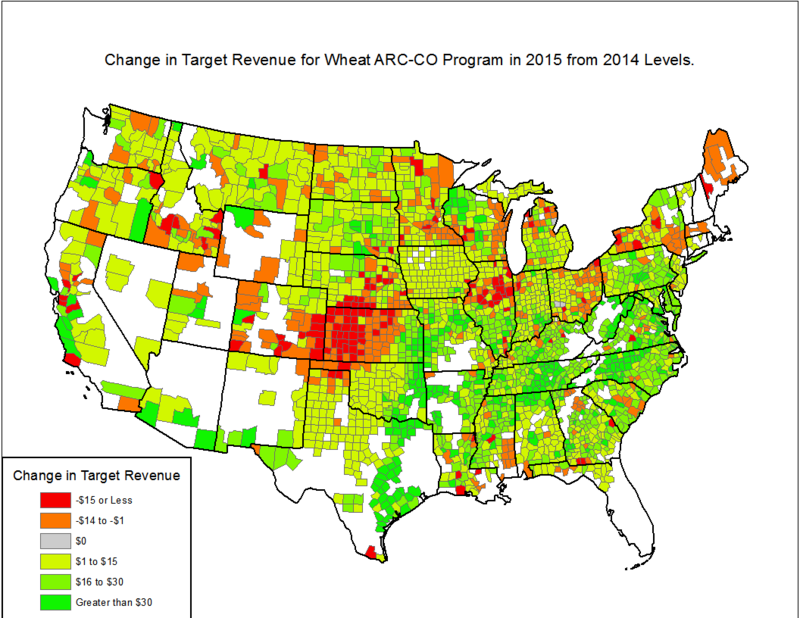 Finally, for wheat the picture is much more positive, with the exception of Central and Western Kansas which has many counties with declining revenue guarantees. Figure 3. 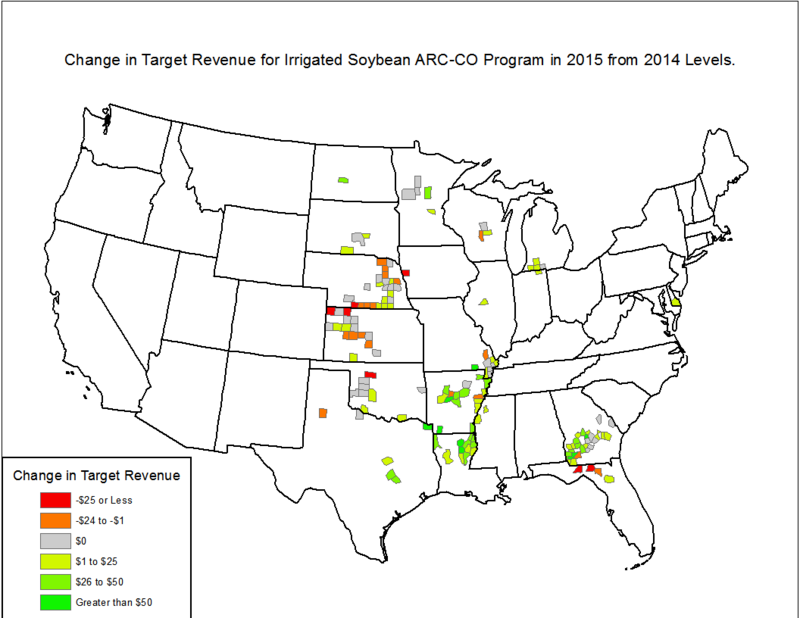 Map of Changes in ARC-CO Soybean Revenue Guarantees. Figure 4. 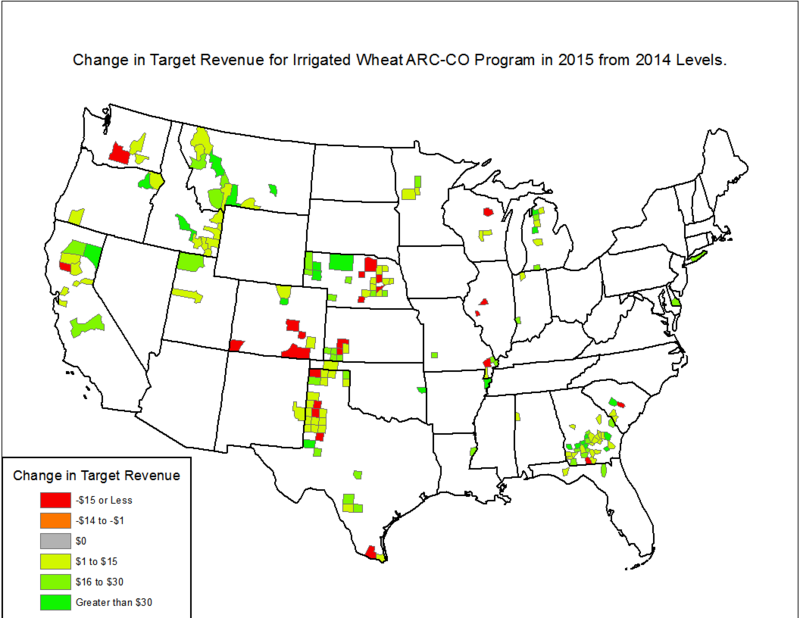 Map of Changes in ARC-CO Wheat Revenue Guarantees. 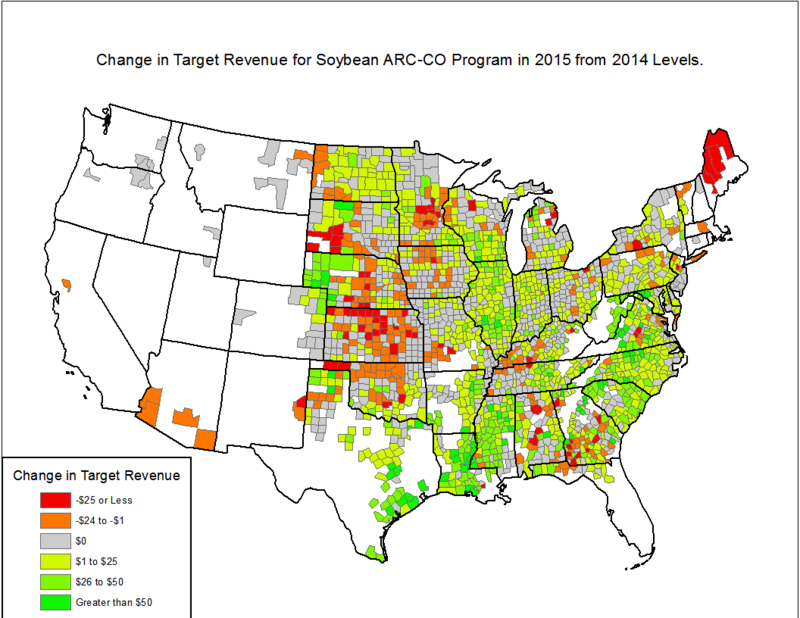 About half of the U.S. corn and soybean producing counties will see their revenue guarantees increase for the 2015 crop year payment (which will be received in late 2016). Given current price levels and the price guarantees associated with the ARC-CO program, many farms will likely receive payments for the 2015 crop. However, these payments will depend upon the actual yields achieved in a particular county, something that won’t be estimated for some time.